This compilation features an in-depth timeline and track breakdown by mcenroe, who recorded, mixed, mastered, dubbed and sold these cassettes while attending college in the mid 90's. Fans of mcenroe, Pip Skid, P&C, Mood Ruff, Shadez, golden age hip hop or good music in general should not sleep on this release! 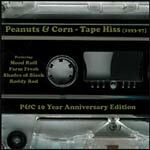 20 tracks of vintage Peanuts & Corn freshness spanning Summer of 1993 to early 1997. 7 tracks never released, 13 others released only on cassette and long out of print.